Yes it is that time of the year to recognise members of the EMC community whether they be from a Customer, Partner or EMC background for contributions to the community that have benefited you personally or action(s) that benefited others you deem worthy of recognition. Get voting and nominate people!! Even better nominate yourself! It only takes a few moments and recognition from peers can enable people to be put forward to the judging committee to decide whether their actions match the criteria for them to be selected as one of the EMC Elect members. I am delighted to say that I was asked to join the judging panel (and accepted) to lend a hand in selecting the EMC Elect class of 2016. This privilege means I am automatically elected to EMC Elect 2016 so this is not a plea for people to vote for me but more to raise awareness that voting for 2016 candidates is live for the month of November. Where do I vote and what is the criteria for nominating a potential candidate? 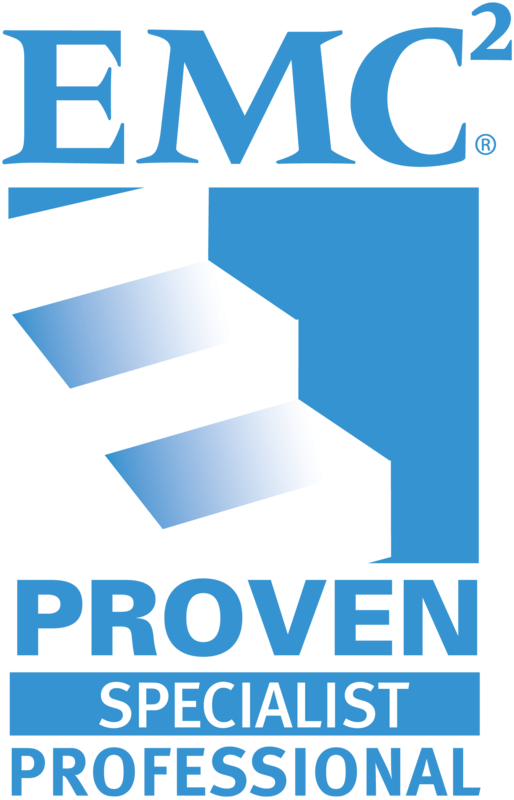 Engagement – Members are those engaging on the EMC Community Network, on Twitter, Facebook, LinkedIn or many other social channels, and in person at events. 2015 has been an excellent year for EMC Elect and 2016 is hotting up to be even better so be a part of it! XtremIO 4.0 – What’s all the commotion about? While the code upgrade process was addressed in previous releases (once inline compression feature was introduced) scaling out the XIO cluster meant a fork lift upgrade (lift the data off, expand cluster and restore data). Native Remote replication is a feature most EMC Customers immediately look for with the likes of VMAX SRDF or VNX with Recoverpoint. You could understand prioritising compression and snap ahead but not an easy discussion point involving the likes of Federated Tiered Storage to achieve it with VMAX or with VPLEX for Recoverpoint. XtremIO 4.0 blows this all out of the water! In terms of Scaling Out you can now scale out non disruptively to 8 Xbricks (or 16 Active-Active Controllers/Nodes) with Xbricks ranging in capacity from 10TB, 20TB and now with 4.0 40TB Xbricks. When Scaling out the XIO Cluster now auto-balances after expansion. The management GUI XMS can manage up to 8 Clusters now so scaling out in this release has been addressed in more ways than one. In terms of Remote Replication with 4.0, Native remote replication is implemented with RecoverPoint Asyschronous replication with a unique snap based solution without the need for any RecoverPoint (array-based) splitter. The XtremIO snap based solutions implemented a SCSI DIFF api for RecoverPoint to issue the instruction to ensure to only take/replicate differential snaps across to target Site (after initial full sync for first snapshot). Coupling this with RecoverPoint’s write-folding, deduplication and compression capabilities means a significant reduction in bandwidth consumption. The current implementation is asynchronous with RTO of <60 seconds. The EMC vLAB demonstrating this technology integration is now available as well so reach out if you want to get hooked up with a demo. For those not aware what EMC vLab is and how it works I will post something on that soon for awareness. Note: For those not aware, RecoverPoint is a well established Replication and Data Protection solution in the Industry with over 23K deployed and present in 85% of Fortune 200 customers but for those not familiar RecoverPoint brings with it Local & Remote (Bi-Directional) Protection and Point in Time recovery capabilities as well as fully integrating with VMware SRM. There is an extensive list of features in XtremIO 4.0 as seen below. I am sure you will see further posts from folk in the community as 4.0 goes GA and hopefully very soon we should be getting a demo unit in our office so hopefully more posts to follow on this topic from me. Yes this is a work related post on a personal blog but temper the tut tuts knowing it is coming from a place of thanks rather than seeking to sell. EMC Partner awards night last Thursday in the Dylan hotel Dublin was a great night and very enjoyable. From the title of the post you can gather that I am glad to inform that Asystec (where I work 😉 ) picked up the most prestigious award of the night, EMC Partner of the year 2015. All the team are very proud of the achievement because all the hard work paid off! It was a mutually successful year for both EMC and Asystec as a result of our partnership developing opportunities and delivering successful solutions as a team rather than two distinct entities. The purpose of the post is to say a quick note of thanks to the EMC technical team in Ireland who were not there on the night for me to say it in person. The EMC Customer Engineers, Implementation Engineers, Solution Architects and System Engineers are an awesome team (no point naming names here, they know who they are!) when they work in tandem addressing the common goal of delivering successful solutions for the customer. Our success last year would not have been possible without these folk. I’m just glad we as a team (Aystec and EMC) were interchangeable from a Sales or Technical perspective without any decrease in quality/standards or customer communication as a result. Now the challenge is to make the next year even better for all concerned! 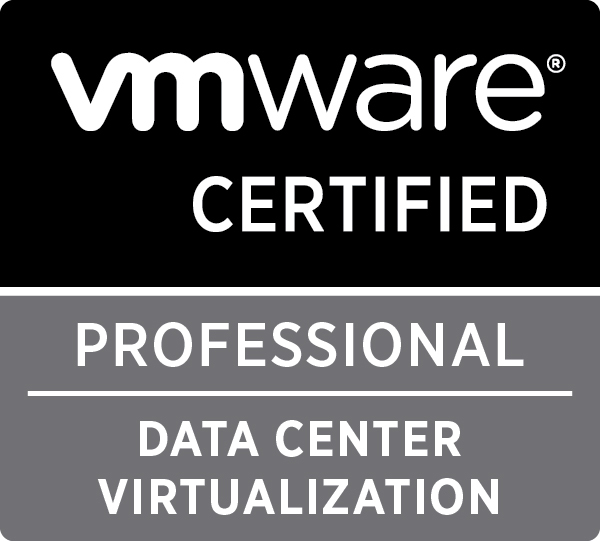 Who is going to receive the medals below for Top VMware Virtualisation blogs 2015?? Time will tell and all will be revealed soon enough but all voting must be completed by March 16th and results will be announced on a special broadcast March 19th. Eric Siebert over at vSphere-land site started producing Top 10 Virtualisation blog lists all the way back in 2008. The concept to me is a fantastic one. It is an acknowledgment and recognition to the VMware Virtualisation top bloggers for their contributions by the very people that benefit from the hard work put into their blogs, you the public. If you find yourself a regular researcher to all things vSphere/related product suites and technologies then you will have come across the many excellent blogs out there. The content pages are filled and fueled by their passion for VMware technology. Please recognise this work by taking a couple of minutes to cast your vote on the 2015 Top vBlogs. There are a number of sub-categories as well to keep things interesting. Look forward to the results as my vote is cast! EMC Symmetrix Federated Tiered Storage (FTS) is a VMAX Enginuity feature introduced under Enginuity release 5876. It has been out some time but after attending the VMAX tech summit EMEA conference recently in Cork it was clear it is now playing a larger role with Symmetrix VMAX3 (100K, 200K, 400K models). Before finding out where something is going I thought it may be useful to explain what it is, how to configure it and when to use FTS from a VMAX2 (10K, 20K, 40K models) perspective. FTS simply put is the ability to present storage from external Storage Arrays to a Symmetrix VMAX which can be used as disk space and is subject to the same rich Data Services that native VMAX physical storage benefits from. 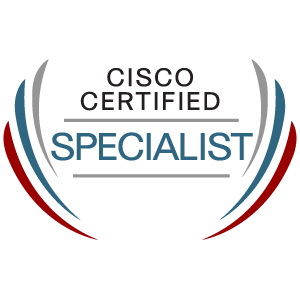 These capabilities include local and remote replication, FAST-VP, VAAI, Virtual (Thin) Provisioning and migration services. Now that is useful from a number of perspectives and I will delve in to that later on. This was introduced with 5876 enginuity. Note: With the introduction of Enginuity 5876.82.57, only VMAX/20K or VMAX 40K systems supported FTS. 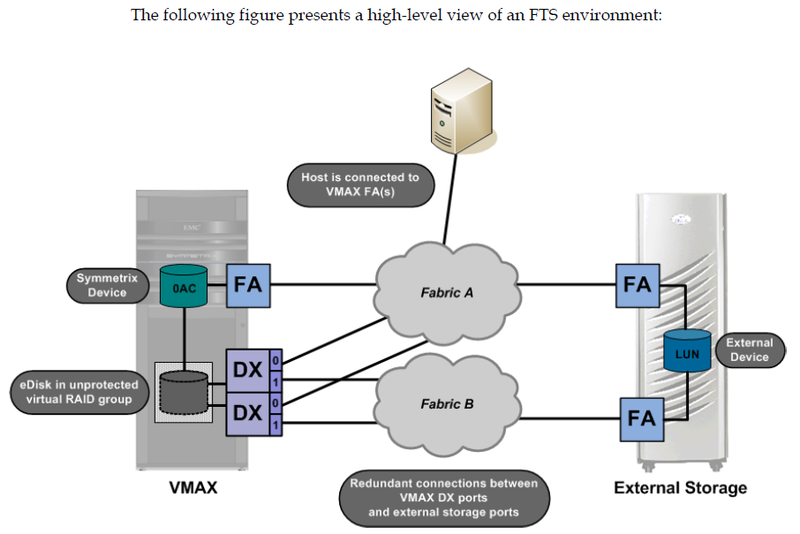 With the introduction of Enginuity 5876.159.102, VMAXe/10K systems also support FTS. The Storage arrays must of course be on the supported list. External luns called e-disk devices can be presented in two ways , as encapsulated devices (preserving existing data) or as externally provisioned devices (raw capacity and existing data is removed). e-disks are unprotected locally by the Symmetrix. Protection is relied upon by the external array. There are restrictions on encapsulated devices that are geometry limited (raw capacity of e-disk does not match Symmetrix device size) and these can be found in the Array Controls CLI Product Guide. For VMAX 2nd generation systems the FTS Tier for FAST-VP does not need to be the lowest Tier in a FAST-VP policy it can be set to any as of 5876.159.102. Also 4 tiers allowed in a FAST-VP policy if FTS is in use. Currently FTS is only supported on VMAX3 with protectpoint (Data Domain encapsulated edisks) which enables the VMAX to backup directly to a Data Domain system. FTS on VMAX3 will be revisited here at some point which may be timed with the release of a future VMAX3 capability or integration point! DX directors must be configured by EMC Customer Engineer by setting the selected FA ports emulation to DX. The rest of the FTS tasks are completely user configurable. The most straight forward use case is utilising FTS to incorporate an external array as another Virtual Provisioning pool of storage from a pure capacity perspective. FTS can be used for Migration purposes as a mechanism to move data from an external array to another Symmetrix array with Remote Replication (SRDF) or indeed locally with LUN migration or via LocaL Replication (Timefinder Clone). Any array integrated with Symmetrix VMAX via FTS benefits from the rich data services which the Symmetrix extremely highly respected reputation was built on. XtremIO is a system which can simultaneously be accessed directly or through the VMAX with FTS. Luns presented through the VMAX could then be remote replicated! Hopefully some readers are still with me. It was a long post but Federated Tiered Storage is a technology to me which is not well known so it may save some folk rummaging for detail on it. It was a topic I was meaning to revisit for some time and now I think is as good a time as any with the release of Protectpoint. Mark May did a post on this Protectpoint is well worth reading here. 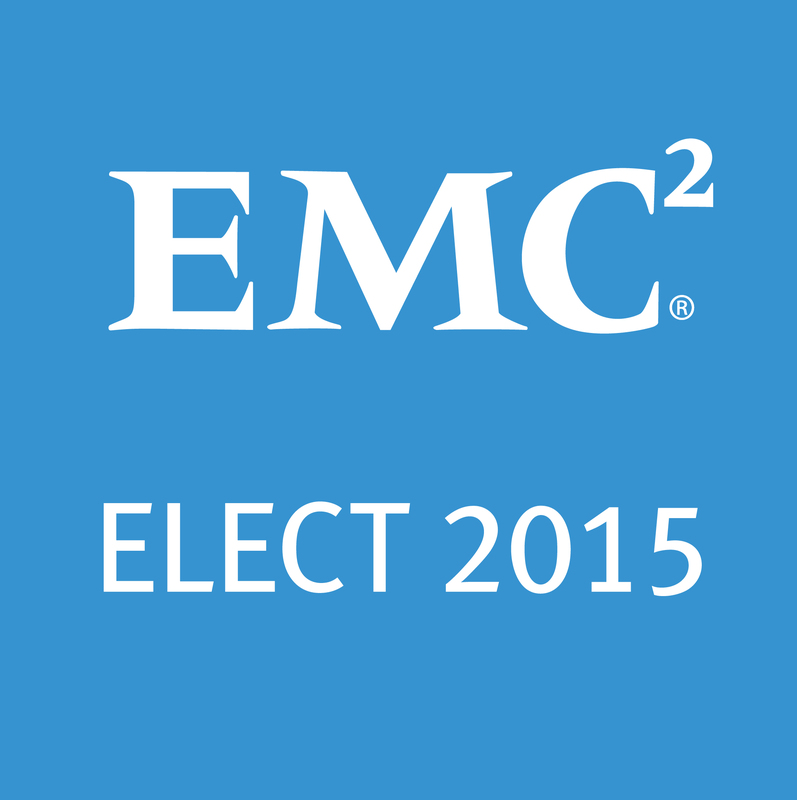 Today EMC Elect Class of 2015 has been announced. I am delighted to say I have made the cut! 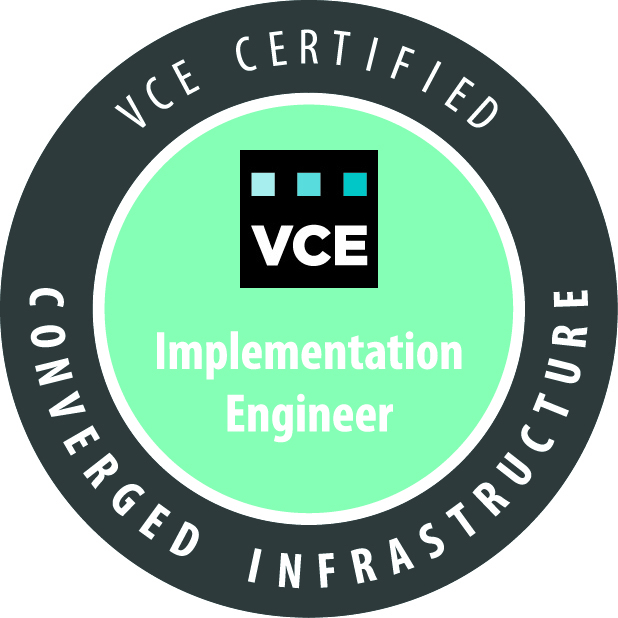 This is not a Technical Certification but is a designation for that calendar year to acknowledge influence, participation, knowledge sharing and engagement with the EMC Community. 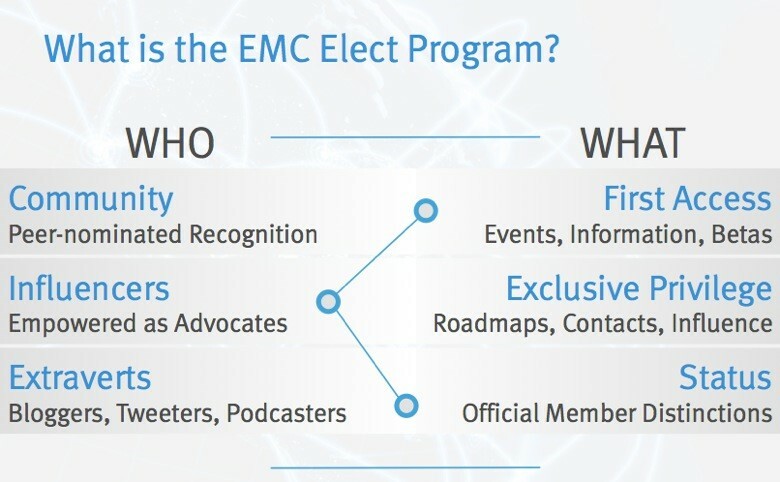 The image below and the EMC Elect FAQ page can help clarify this even better. On my first blog post I mentioned that there was a bit of coaxing for me to get this blog off the ground. I had a call recently from Mark Browne to discuss EMC Elect and what it meant as well as discussions we had in EMC World last year around the community in general. I love our chats we discuss all sorts but during it I did acknowledge how a blog would really help my cause on getting unique content out “there” as well as a medium to expedite what I felt was lacking at the moment a local user forum and conduit for customers to find out whats good as well as feedback what is not! I will be consulting with EMC Elect colleagues initially and then seeking out assisting from “you”. Two main objectives will be to see is there an appetite for this and if so what content would benefit most.